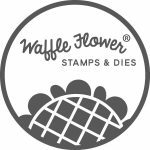 Welcome everyone to Day 1 of Pretty Pink Posh November 2018 release Blog Hop! It’s about Holiday Season. So let us bring you some holiday spirits with our products! I am showing you three cards that I made for this Blog Hop today. For my first card, I colored images with Kerutake Zig Clean Color Real Brush Markers from Pretty Pink Posh Poinsettias and Elegant Holly Stamp sets onto Bristol Smooth paper and die cut them with coordinating dies (For Poinsettias / For Elegant Holly) I highly recommend you to use coordinating dies so you could boost up your productions for upcoming holiday card making. I grabbed a piece of Tim Holtz Distress watercolor paper and randomly added a thin layer of watercolor paint in light blue. Once it’s dried, I splattered the same paint along with some white paint over the background. I assembled my colored images onto the background using Multi Medium Matte and Foam tape. For floral arrangement, I searched google images to get inspirations. To create snow flakes laying on the Poinsettias and the leaves, I also flicked some white paint over them. At last, I stamped the sentiment “Searson’s Greetings” to the lower corner of card using Vesamark embossing ink, then embossed them with Gold embossing powder and heated to set. I embellished the background using Pretty Pink Posh 4mm Sparkling Clear Sequins and 6mm Sparkling Clear Sequins to finish. My second card is a shaker card. Of course! 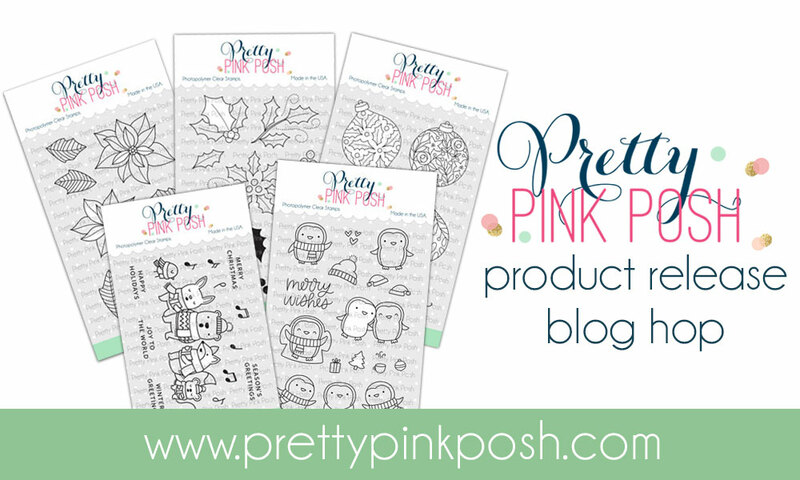 We are with Pretty Pink Posh, the shaker elements heaven! I colored images with Kerutake Zig Clean Color Real Brush Markers from Pretty Pink Posh Decorative Ornament Stamp set and die cut them using the Coordinating dies. I also die cut the pine branch from a piece of white card stock paper using Pretty Pink Posh Pine Sprigs Dies and set them aside for later use. To create the background, I ink blended with Tim Holtz Distress oxide ink in Peacock Feather and Lucky Clover onto an A2 sized watercolor paper. I splattered water and quickly removed all liquid with paper towel to create distress look. Then I splattered the mixture of Peacock Feather ink with water over the background. Once it’s dry, I started to create my shaker window. I positioned Pretty Pink Posh Stitched Diamonds Die in the center of card panel to cut my window. I attached a piece of acetate paper right underneath of window opening. I adhered a colored ornament image to the negative of the window cut out along lots of Pretty Pink Posh 3mm Sparkling Clear Sequins. I sealed the window using Foam Stripes. I attached colored images and die cuts onto the front panel. I stamped the sentiment “Searson’s Greetings” to the lower corner of card using Vesamark embossing ink, then embossed them with Gold embossing powder and heated to set. To add some interests, I used couple of berry images from Pretty Pink Posh Elegant Holly Stamp set and I scattered a few Pretty Pink Posh Jewels in Raspberry color. Now let’s shift to a cute and whimsical card. I colored the images from Caroling Critters Stamp set with my copic markers and hand fussy cut them apart. I also colored holly leaves from Elegant Holly Stamp set and cut with it’s coordinating dies. I ink blended the background using Tim Holtz Distress oxide ink in Twisted Citron and Mowed Lawn. Then I cut the window using Pretty Pink Posh Storybook 5 die. I raised the window cut out with some Foam strips to make it more 3D. I assembled all prepared pieces onto the background panel and then stamped music notes and sentiment that are also from Caroling Critters Stamp set. In the end, I added Pretty Pink Posh Jewel in Raspberry to pull everything together. There are 4 $25 gift certificates up for grabs (two winners each day). Winners will be picked randomly along the blog hop. Comments must be left by 11:59 PM PDT on 11/20/2018. Winners will be announced on the PPP blog. Hop with us now! 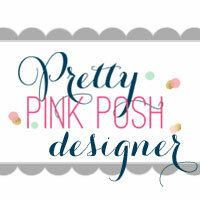 This entry was posted in Cards and tagged Blog Hop, Pretty Pink Posh. Love them all, such sweet cards! Love them all but the Poinsettias are stunning. TFS. All of your cards are awesome! I especially love the ornament shaker card! I love all of these. Thank you for so much inspiration. Oh my gosh, each is so perfect for different reasons. I love the sequins and watercolor background of the first, the ORNAMENTS are wonderful and detailed (must have), and the carolers? OH SO CUTE with their pink cheeks, etc. LOVE your cards! I get a kick out of the bird on the branch listening to the singers. He/she might be thinking: it’s nice to hear others sing for once. Nice. 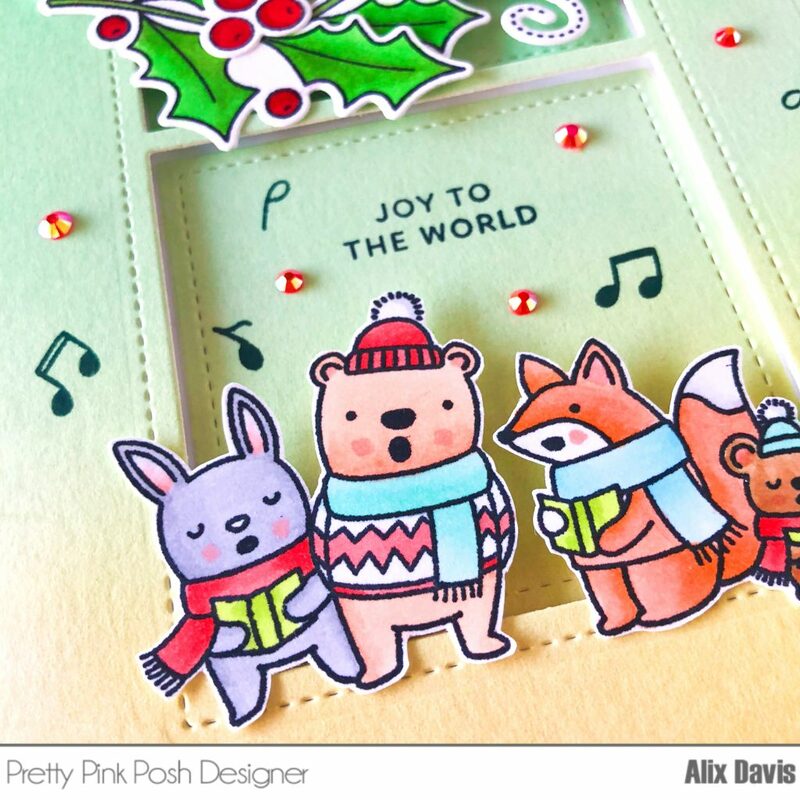 Alix, I’ve seen many cards with ink blending from yellow to pink… yours from yellow to green is just gorgeous, and bright… such a perfect stage for these carolers! I see you’ve managed to make those Zigs sing, too! So beautiful! These are all lovely. I love the poinsettia set and the holly set the best. Having a coordinating die available is so nice. Beautiful cards! Love the bold colors. Lovely cards–fabulous coloring techniques used. Wow!! Your cards are so so so much fun! 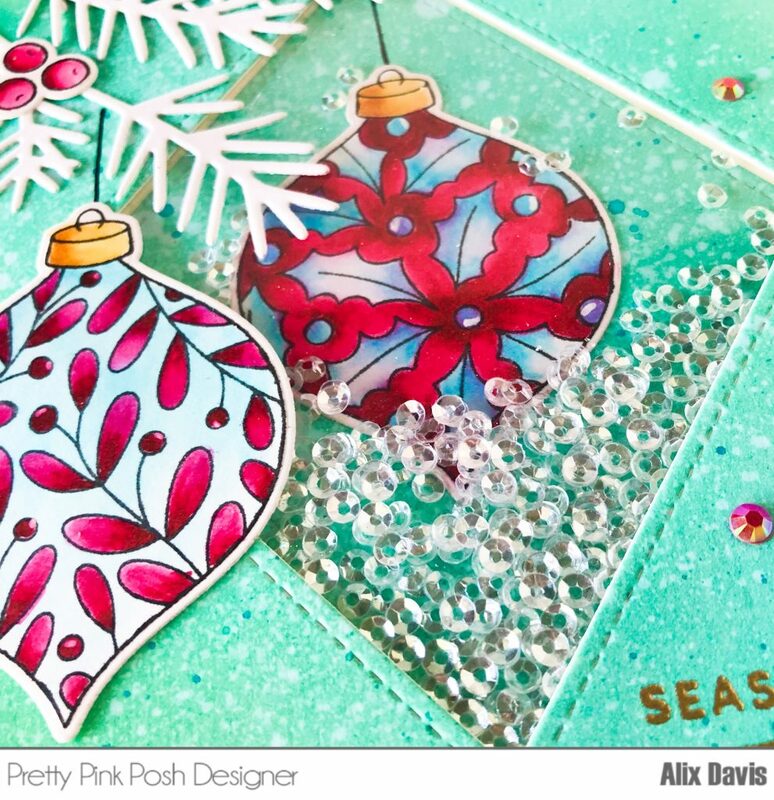 My fave has to be the ornament shaker card – the colors just pop, it’s fun and beautiful at the same time! Really pretty and fun holiday cards. These are all so beautifully perfect for the holidays. They’re all beautiful, but the poinsettias are my favorite from this release, soo…. I bought ‘Elegant Holly’ set and think it’s the prettiest artwork for holly ever in the history of holly! Your penguin fellas are adorable! Wow your cards are amazing! The ornament shaker card is fantastic! Stunning poinsettias! Your coloring is lovely. Your carolers are so sweet! LOVE, LOVE, LOVE your ornament card!! Beautiful and elegant cards, thanks so much for sharing and inspiring! Beautiful and festive cards! Gorgeous vibrancy and designs. Love your cards. The ornaments are beautiful! So many beautiful cards! Your coloring and water coloring and blending of colors is absolutely gorgeous! I just love how each card is of a different style too! Beautiful projects! I love you coloring. wow your cards are gorgeous – beautifully colored !! All of the cards are wonderful! Love the decorative ornaments set. Beautiful blending on all your cards. Your cards are so amazing!! That shaker card is swoon worthy! Your coloring is amazing! I LOVE them all! Your cards are so nice. Joy to the world is my favorite. Love these cards and the entire release! What a lovely collection of cards. So bright and festive. Thanks for sharing! Oh wow! Love them all! Gorgeous poinsettias and adorable critters! Thanks for showing some cards using zig markers to color the images! Beautiful cards, love, love, love! All 3 cards are super cute, I always love a shaker and yeah PPP has the greatest shaker elements! Oh my!!! Your cards are so beautiful!!! Stunning colouring!!! I love your cards! 🙂 The speckles on the poinsettias are really neat, and I love how you made the shaker card. Oh my goodness… all of your cards are wonderful… Love the poinsettias. And the ornament shaker card is FABULOUS! Beautiful poinsettias, wonderful ornament shaker and cute carolers. Your poinsettia and ornament cards are absolutely STUNNING! Your carolers card is super ADORABLE! Love them all!! What wonderful cards. love the little penguin’s and the poinsettia!! All of your cards are so beautiful, but those big bright poinsettias have melted my heart! SO much crafty goodness here! Stunning shaker card is my favorite!!! I forget to make them and they are always thrilling with the PPP sequins! Gorgeous cards and want to be as talented as you are to color like this!! Am so in love with these new releases!! Such beautiful cards! I love that shaker card, just gorgeous. I also love those beautiful poinsettias, and your sweet little critter card is just adorable! Awesome cards. Love your shaker idea! So fun and adorable, great job with tThanks for sharing your work with us.he coloring. Such stunning cards. You are great with your coloring. The shaker card is gorgeous!! Wonderful work!! I like the mixture of the two stamp sets (holly & poinsettia), and the ornament shaker card has a new (to me) layout that is so refreshing to see. Great job. Sweet cards! I especially love your window cutouts. Fabulous cards, Alix! My favorite is the poinsettias. Your watercoloring is beautiful and the arrangement on the card is gorgeous! The soft blue background really makes the red flowers pop. Love all 3 cards! Thank you for sharing. My favorite project is the one with the ornaments. All your cards are Wow! Great coloring! Love your cards! The colors and layouts are beautiful! Oh my! They are all fabulous. More wonderful ideas. Thanks for sharing! i love these Caroling Critters! How fun is that?!?! The other cards are also very pretty and a great way to send Christmas greetings!! Amazing cards; love the ornament shaker. Fabulous cards! Love the poinsettias and ornaments! The little caroling critters are just adorable! Beautiful cards, pretty poinsettia is so elegant and the decorative ornaments are too (my fave). Those caroling critters are so fun and super cute. SWOON!! SO BEAUTIFUL!! LOVE ALL of the AMAZING Inspiration!! THANKS for sharing and have a FABULOUS WEEKEND!! 3 amazing cards, but the poinsettias are incredible. Thanks for the inspiration. Loving all of your beautiful cards! Wonderful cards. I love those gorgeous poinsettias. Beautiful cards! I especially love the white flecks on the poinsettia! Great technique! Your cards are amazing! I love each one. Stunning creations! Love the shaker! such cuties!! and such pretty flowers. Great cards! I love them all. These are all beautiful!! But I LOVE that ornament card; so gorgeous! AWESOME cards!! They are all so colorful and pretty. What wonderful and creative cards…love the gorgeous colouring and sweet images. Your cards are wonderful! All the detail, colors and little additions are fabulous! Thank you for sharing. Your cards are gorgeous.